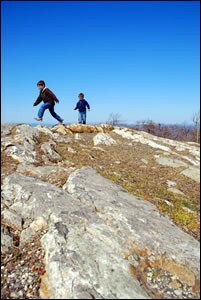 (17/P2) TRENTON – The highest point in New Jersey will be the backdrop for a variety of invigorating and family-friendly outdoor activities this month at High Point State Park in Sussex County, the northern most of New Jersey’s 40 state parks. Adults and children can sign up to participate in a range of activities such as storytelling, games and crafts focused on nature during wintertime; outdoor exploration; and trail walks at the park in Wantage Township. To learn more about each program or to register, email register.highpointprograms@gmail.com or call (973) 875-1471. Nature in Winter Walk: A guide and participants will look for tracks and signs of wintering wildlife, as well as dormant trees, plants, insects and more. A limited number of snowshoes in child and adult sizes are available, and must be reserved by 4 p.m. the Friday before each walk. Use of snowshoes will be weather-dependent. Reservations are required and locations vary. Ages 7 and up. January 12 and 26, 1 p.m. to 2 p.m.
January 13 and 27, 10:30 a.m. to 11:30 a.m. Fledgling Naturalists: Children’s curiosity will be encouraged through hands-on outdoor activities involving stories, games and crafts. For children ages 3 to 5, with an adult partner. Each adult may bring a maximum of two children, not including infants. Children or siblings over age 5 may not attend. Registration is required by 4 p.m. the day before the program. Fee: $5 per adult/child pair, $2 for additional children ages 3 to 5. January 13, 1:30 p.m. to 3:30 p.m.
Homeschool Naturalists: Hands-on activities will give homeschooled children an opportunity to explore the natural world and interact with peers. Suggestions for additional study and resources will be provided. Registration is required by noon the day before the program. For children ages 6 to 10 in grades 1-5 with some ability to read and write. January 14, 2 p.m. to 3 p.m. Snow and Ice: Games, crafts and experiments will be utilized to teach families about snow, ice and winter weather. A guide will explain how park wildlife survives frozen temperatures, and participants will be able to cut their own snowflakes. The free program is both indoors and outdoors. Ages 6 and up. The 15,413-acre High Point State Park is well-regarded for its hiking and skiing trails, as well as locations for camping, fishing and numerous other activities. Established in 1923 in the state’s Skylands Region, the park also is home to the High Point Monument, the highest point in New Jersey. The monument rises 1,803 feet above sea level, and offers a spectacular panorama of hills, valleys, lush farmland and more in New Jersey, Pennsylvania and New York.